On closer inspection, the label on the front read “Grey’s Anatomy”! Is there no end to cross-promotional merchandising? 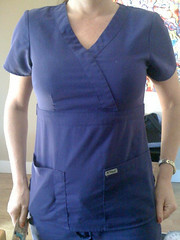 The nurse and I had a nice conversation about how much she loves the top, that even more than the fit and the deep purple color, she loves the softness of the fabric (probably a cotton-poly blend twill from what I could tell). And she promptly gave me her contact info in case I wanted to make scrubs for her. Can you imagine? 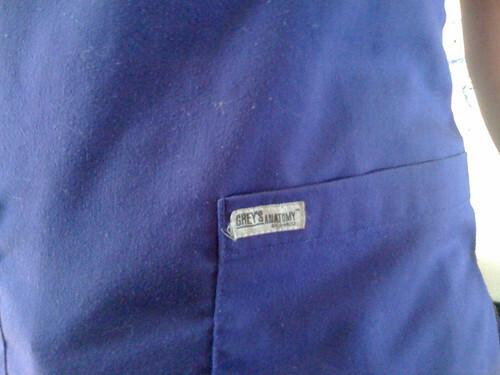 A custom sewing/ design job making scrubs! This winter it has been a t-shirt under a knit dress, leggings, knee socks, and shoes on errand days or heeled boots on fancier days. In winter it’s usually a dress and sandals or flip-flops. I haven’t mentioned this in a long time: All my work-at-work clothes are ill-fitting, as in pants that are too big around the waist and hips so the crotch hangs too low, and jackets whose sleeves are too long and shoulders are too wide and shoulder pads are too poufy. I bought them all, from very reputable stores. But even a well-made suit looks junky when it doesn’t fit. shorts in summer. But again, not often and nothing noteworthy. it will get me started. I feel like I’ve got to give some more thought to the fabric. My sewing buddy IRL Leslie says there is a place here in Philly called Jomar that is a great destination for wholesale fashion fabric… maybe I will make it there before I head home and find the exact fabric I need for this unlined first pass at a Chanel lookalike jacket. Any fabric suggestions? You make me laugh. Even though i have never met you, i can totally see you asking the nurse to take a picture of her uniform! did she think you were crazy? glad you are starting the chanel. i need a kick in the b***! i have stalled! I agree with Cindy... I can totally see you asking the nurse for the pictures, too. :) Good luck with the Chanel jacket and have a safe trip home! I love that pattern - it looks retro - is it from the 80's? I love the little tuck in the sleeve head - a cute detail. I have to say also the final proportions are good too - when I sewed my chanel style jacket I found it looked best hip length but I really didn't have enough fabric to finish it there so had to shorten it. OMG! Philly!! We're in the same time zone!! and like an hour apart!! 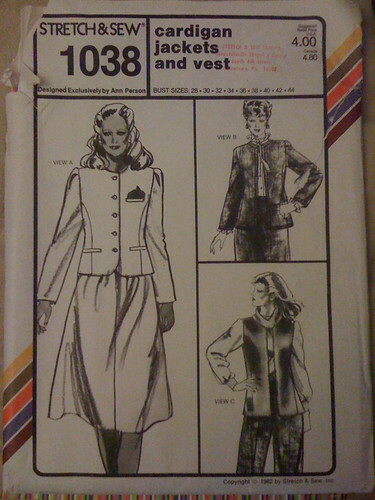 You are so industrious - I can totally see you starting a cute line of uniforms as well as see you complete that chanel jacket. I've been thinking a similar thing about creating a work wardrobe/uniform that's nice to wear and makes me feel good. I'd love to create smart jackets and pencil skirts but i have to go more of the trousers and top route (I'm an occupational therapist so need to move around). I've got my thinking cap on though. Good luck with yours, I'll be keenly checking for progress. Have fun making your work clothes! It's worth it to be in clothes that fit, which are so tough to find if you're buying in stores. Willie Nelson's voice, "...on the road again..."
Brrr - it must be COLD in Philly! My first uniforms were BDUs - Battle Dress Uniforms, also known as fatigues. The color option was an amazing combination of khaki, black and olive green in a lovely mottled pattern. The entire ensemble was complimented with various and sundry patches, nametags and rank bars sewn all over the top and a lovely pair of black leather, chunky heeled, steel toed boots! On special occasions, a flak jacket, side arm and a M-16 rounded out the look. LOL..honestly, I LOVED my mess dress, the military formal wear. the jacket was very Chanel like in structure with epaulettes and silver braid. It was short, worn over a ruffled tuxedo shirt with pearl studs, a floor length pencil skirt slit up to the thigh and a satin cumberbund. For your jacket - opt for tropical weight wool, because it is easy to work with, has a heavy enough hand to hold it's shape, and will be comfy for most of the year. You can make the finished garment home washable by washing the wool suiting before you cut and sew. I would choose a suprising color for myself, like eggplant or rich chocolate brown, just because everyone else I work with (ahem, a bunch of guys) wears black. I am so totally suprised at your work-at-work uniform! Given what you do, I expected more "pay attention" garments, and having seen your incredible skill at design and garment structure I did NOT expect to see the words "ill fitting"! :) It may be time for some deconstruction and tailoring of those items purchased from reputable stores. Oh, and just so you know...I am at work right this minute, wearing a pair of dress pants that have a safety pin at the waistband because they are too loose around my waist and I can't find thirty minutes to deconstruct the waistband and take them in. The pants, however, are not black. I can't believe there are Grey's Anatomy scrubs... that is quite hilarious. And I support your effort to craft the perfect grown up garamimals! 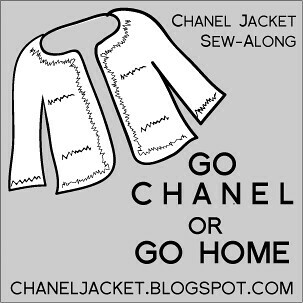 @NGLaLaLa - Thanks, I am finally getting that silly Chanel jacket started! I might visit Jeanie this weekend and see if she has something good I can make my first version from. @Kyle - Didn't occur to me till tonight I should have tried to coordinate meeting up here in the northeast, but no worries. I'll see you soon enough! @Phill - Yes, I need pantsuits as sometimes I sit down at the front of the room and skirts are too fussy. I also forgot that I might put together a "travel" uniform, too -- looking sort of appropriate, not sloppy, and for sure comfy. Let me know (email, here, or on your blog) how your uniform evolves for you. @mjb - I think you're right! I've gotten so used to work clothes that are too big that they are my standard for fit. Not good. Look forward to getting home and getting started. Hey! I am so curious about what you do, career~wise! Something where you sit in the floor in the front of the room sometimes, hmmmmmmm. I have a close friend who is a nurse at children's and she looks hot in her scrubs, so I knew there were styley ones...., I'm gonna ask her if she has any grey's scrubs now. I thoght of some kind of washable wool for your jacket too?? Fun project. @Violet - You know, after your and Angela Pea's comments above, I wondered why I haven't altered them yet, either. I remember how my body kept changing the first few years after having my son, like the weight and padding kept sort of shifting around -- the waistband of a pair of pants would be snug one month, then the next month the waist would feel fine but the thighs were pulling. Just realized that I can probably alter those pants now. Having said that, I have not made enough jackets that I am confident tailoring them at all. It would be diff. if I could completely deconstruct and re-cut them, but I think we're talking a half inch here and a half inch there. I'll think about it some more and let you know if anything useful comes of it. i was saying hmmmm, to express the act of wondering i was doing, about your career!! and i am definitely into that sort of thing you just mentioned on my blog!! i will look into that book at the library this week!! thanks so much friend!! oh, and thanks for sharing! that sounds like a full and challenging career to me. i bet you are talented. Be prepared - 4th St. below Bainbridge is Fabric Row in Philly...don't park so far that it's not an easy walk to take your purchases if you're easily swayed by lovely fabrics and trims. Ask me how I know, lol! your #1 uniform sounds easy and perfect--much better than my sitting around in my pjs at home, and then throwing jeans on whenever I need to venture out into the outside world. This looks good too; maybe I should aim for something like that? We don't get to pick our scrubs at work, so I've had luck altering the square green smocks with a few darts. I've felt the GA brand in the stores and they are nice. The usual ones feel like cheap bedsheets.